Automatic chlorinators are chlorine feeders for home pools. 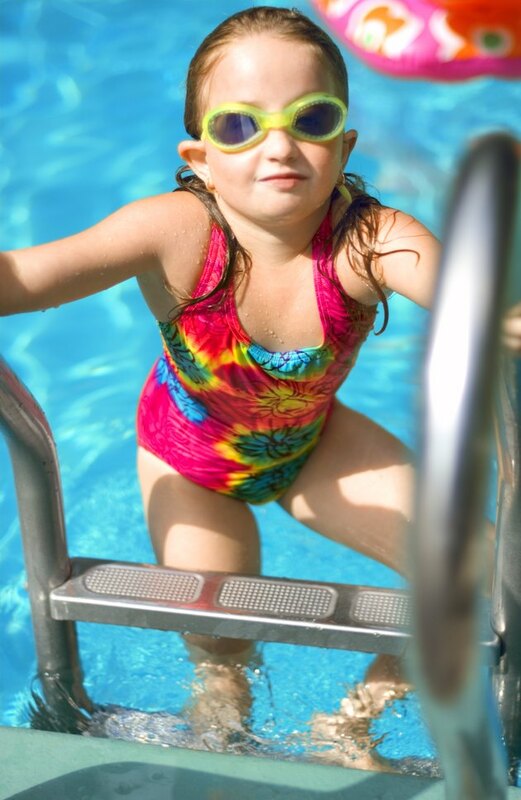 They are used to maintain a constant level of chlorine in the pool for proper safety and sanitation. There are two types of automatic chlorinators: in-line chlorinators and off-line chlorinators. In-line chlorinators are permanently installed into the water return line of a pool. Off-line chlorinators can be easily uninstalled or retrofitted to a pool because the feed mechanism is on a separate line tapped off the main water supply line of the pool. Chlorination systems are essential for pool sanitation. According to PoolPlaza, there are many disadvantages to in-line chlorinators that can affect personal safety and sanitation of the pool. In-line chlorinators are known to have flow problems when the flow through the pool return water is low; the chlorinator can not draw in enough water to fully dissolve the chlorine tablets inside the chlorinator, resulting in an inadequate chlorine feed. Because of this design flaw, air pockets can form in the chlorinator that block water from reaching chlorine tablets above the bottom tablet, a problem that restricts the amount of chlorine released. Additionally, there is a higher risk that chlorine gas can build up inside an in-line chlorinator, presenting a hazard of respiratory injury if released. Family Pools Online points out two major advantages of in-line chlorinators: appearance and ease of maintenance. In-line systems are installed directly into the return water piping of the pool and therefore do not have extra hoses, clamps and attachments that can become loose, dislodged or otherwise damaged. This design also makes installation easy, as the pool line can be cut and the in-line system fittings glued in place. Appearance of this system is more aesthetically pleasing, according to Family Pools, because of the lack of additional hardware. Off-line chlorinators are susceptible to forming air pockets in the chlorinator housing if air bubbles get into the feed line of the system. Additionally, because the intake for this system is installed before water flow reaches the filter, the intake is susceptible to becoming clogged by debris. Off-line chlorinators have several benefits. For example, the intake line for this system is installed in such a way that water flow reaches the chlorinator before it reaches the filter, avoiding problems with water flow, thus ensuring a better dispensing of chlorine than with an in-line filter. INYOpools.com adds that the off-line chlorinator is ideal for retrofitting existing pool systems. This is because its installation in the pool system is not permanent. Craig Murphy began writing professionally in 1996 for the "Exponent." He holds a Bachelor of Science in industrial technology management-occupational health and safety from the University of Wisconsin-Platteville. Murphy has also earned the Associate in Risk Management designation from the American Institute for Chartered Property Casualty Underwriters. How do I Troubleshoot a Pentair 320 Chlorinator?